February | 2012 | Save the Kales! 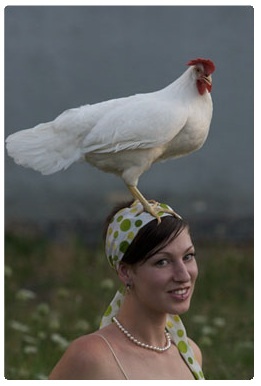 Blogging is funny. The name is funny. The first time I heard the word “blog” my face twisted up in a grimace because it reminded me of “Blaaarrrgghhhhh”. Though bloggers have had a bad rap over the years, everything from “All bloggers are narcissists!” to “Just because you can write one doesn’t mean you should…”, I think on the whole blogging – whether as a pursued hobby or professionally – has come to give us the points of view and opinions we often miss in more traditional forms of journalism. I found two posts recently, on different sites, that discuss a few aspects of blogging most writers don’t talk about. I suspect there has come a time when any blogger has felt these things, whether they acknowledged them right away or they recognize familiar feelings when brought up directly. The feelings of these writers are relatable to anyone, and I hope they’ll mean something to you by either being immediately relatable or simply to offer a “behind the scenes” look at what spilling it all on the internet can mean for some people. This first segment comes from Healthy Happy Life – a cooking blog that is truly one of the best, most comprehensive and beautiful cooking blogs on the entire internet. Hands down. Sandwiched between (see what I did there?) countless posts of the loveliest and most inspiring recipes you ever did see, I found this post that addresses the sometimes uncomfortable feelings that come up when people don’t take your passion seriously. Perhaps at times you don’t even think of it as “serious work” because it’s never been defined as such. Behind any finished product, hidden away from what is presented to an audience, a lot of work, time and money can go into something like blogging (or any hobby or profession, really). Take yourself seriously, and others will follow suit. “Still strolling the market I whip out my camera and snap away at the golden satsumas glistening in the morning sunshine. No, I’m not a photography hobbyist or a tourist gawking at the produce and to-die-for weather. Living, breathing and sharing healthy vegan food is what I do for a living. I love my job. But.. I love my job. But I hate my title. So I’m changing it. Her new self-made, say-it-proud title is: Internet Content Producer. Sounds fancy! What a great idea. I just found the next blog when doing a search for vegan pregnancy books. This blogger is also a published author, and I am only kicking myself for not knowing about her earlier – especially now, but more on that in a minute. Sayward wrote Bonzai Aphrodite – a vegan cooking, urban farming, eco-chic design and DIY blog. Everything she writes is told from a positive, encouraging and often times funny voice, and she makes it seems like any of us can tackle these projects or lifestyle changes. Sadly, her most recent post is also her last. It’s an incredibly beautiful and intimate look at what a person can go through “off camera”. I encourage you to read the entire post. “The dilemma essentially is this: bloggers want to perpetuate positivity. To lift people up and empower them. We want to show you beautiful things. Or maybe I should just speak for myself. That’s what I want. But in doing so, we paint an unrealistic, idealized version of a person – me – and of a life – my life. Again, just speaking for myself, I fear that I’ve created an impossible standard. A measuring stick whereby readers, trying to live up, will always believe they fall short. I know this because I’m also on the other side of it, with other bloggers, comparing myself to my perception of them, and feeling like I’m “less than”. And I know it because people write to me, feeling just exactly that way after reading Bonzai. “Over the years, one of the most frequent questions I’ve received is: “How the hell do you do it all?” Ha! But I’ll tell you the truth. For the first time, I’ll actually answer the damn question. It comes at great cost. In order to “do” so much and give so much of myself, I set aside the things which are the most important. I sacrifice my relationships. I. Am. So. Burned. Out. I need to clear everything out so that I can really see. I need some quiet so that I can take stock. I need to slow down. I need to know what it feels like to not always live a week (or a month) behind at my life. I need to find my happy, because I seem to have misplaced it. 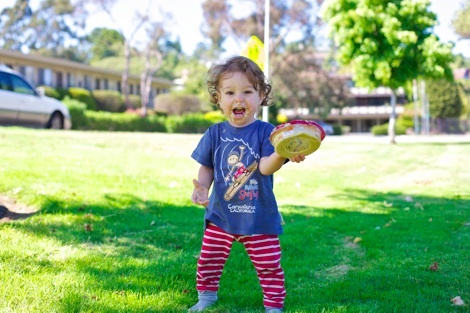 Bonzai Aphrodite - cute happy vegan baby enjoying hummus. Too cute! 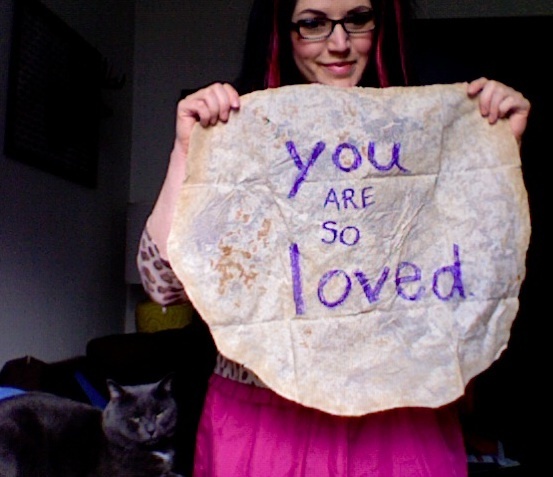 I read my favorite blogs enthusiastically, and a new post feels like a letter from a friend. When it comes to the more personal blogs, the authors actually seem to become my friends (some cases, in real life). I rely on them, I trust their advice, I want them to do well and be successful and happy. It can be hard to put yourself on display and become vulnerable to people interpreting your life through their own eyes (and then of course, there are always those few people who love to dislike you, who can turn out to be the most loyal readers of all). I have respect for anyone who takes action to follow their dreams and put themselves out there. You are a modern day hero. How’s that for a title? 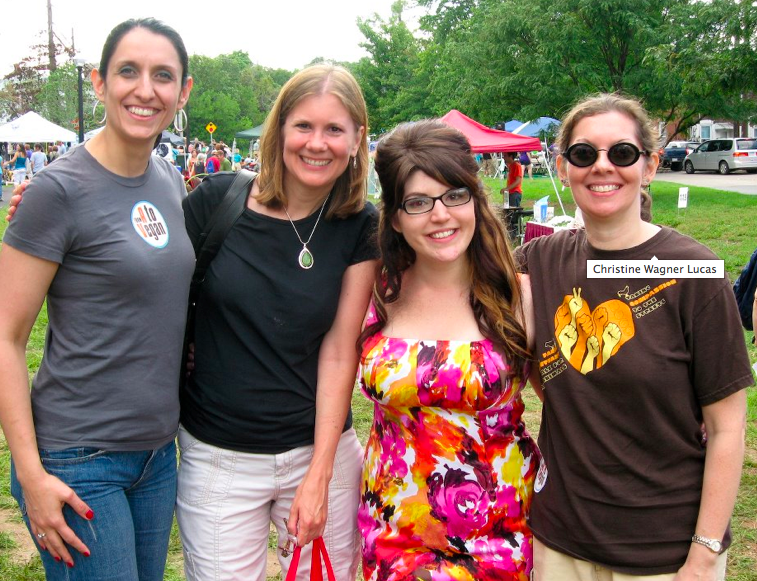 Consider this your “Save the Kales – Save the Date” for Bethlehem Vegfest 2012! September 8th from 11am-6pm, we’re bringing back what was resoundingly called one of the best festivals Bethlehem ever had. With record numbers (over 10,000 people, ya’ll), this one will be bigger and better as we have the figure-stuff-out year one under our belts to move forward with expanding on the great things and adding more elements! This is one thing that will not change: The Vegfest committee invites anyone who would like to be involved to come to planning meetings or to share ideas to do exactly that! You can be a part of making this festival the best — so come to meetings, offer ideas, or offer your time. You’re invited. It’s an unbelievable amount of fun, and you get to meet so many friends and neighbors. Party time, all the time. Impressive Vegetable Float I found on Google, not ours, but it illustrates the idea. Somewhat. Bethlehem’s Saint Patrick’s Day Parade is happening on Saturday, March 17th and Vegfest is having a float! Here’s where it gets interesting – I was voted (unbeknownst to me) to be the Garden Fairy Princess, and the float still needs vegetables to follow me into the magical garden. This feels silly to type! If that isn’t enticing enough on it’s own (heh), the BEST vegetable in the parade will win $100 cash and become the official 2012 Vegfest Mascot. 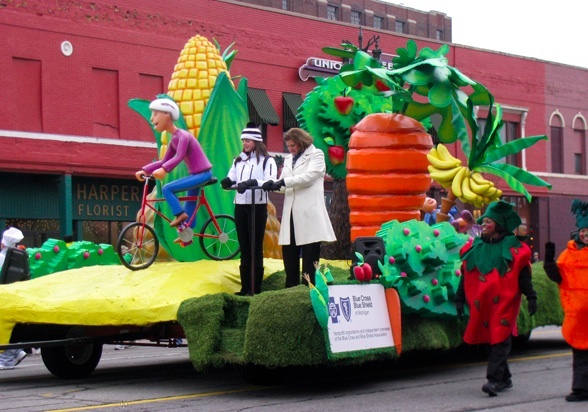 GO HERE TO LEARN MORE about becoming a walking vegetable in the parade! Check out the Bethlehem Vegfest FACEBOOK PAGE to stay updated. I’ve been working more, exercising more, and still finding that balance of making sure we always have healthy food in the house. This works out well for my reignited love and admiration for simple, whole food meals. Sometimes I browse food photography sites and it’s always the somewhat rustic, easy dishes bursting with natural colors and no-fuss presentation that feel the most wholesome. Lucky for us, those meals are often the best for us and most budget-friendly. This post also illustrates how inexpensive whole foods cooking can be, especially when it comes to beans. I bought a bag of beans for 79 cents. I used half the bag, 1 cup of dried beans, which expanded to nearly 3 cups once cooked. 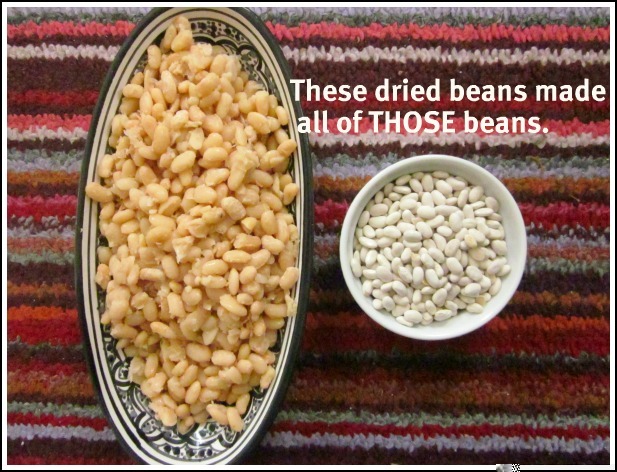 Cooking dried beans is cheaper than buying canned! *Note that beans cooked from scratch can also be frozen if you don’t use them all right away. Cooking is easy. Start with a 1:3 bean to water or vegetable broth ratio, and add more water during cooking so that beans are always just under some water. Cook time will depend on the type of bean, so just keep eating some to see if they’re done. Cooking them in vegetable broth makes them taste DELICIOUS and you can, and will, pop them in your mouth like candy. Move over jelly beans, we’ve got flavorful cooked beans. 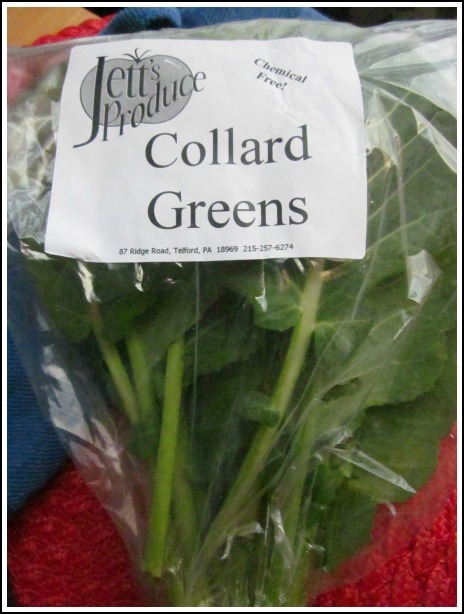 Over the weekend I made it to the indoor winter farmer’s market at SteelStacks in Bethlehem, and officially got to meet the lovely folks from Jett’s Produce located in Telford, PA.
All of the vegetables on their table looked picturesque and beautiful, and I used the last few dollars I had on me to pick up these collard greens. Aren’t they gorgeous? 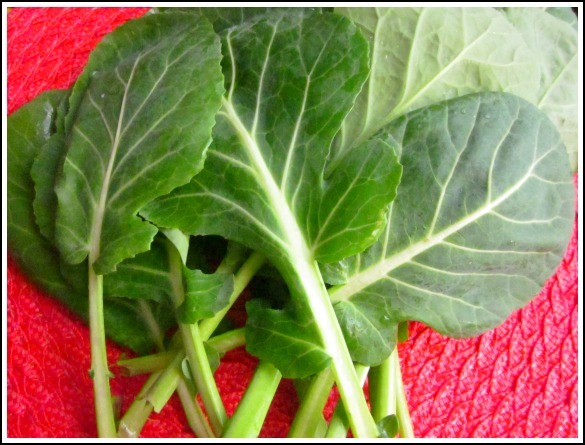 I don’t think I’ve ever seen collards with round, almost fan-like leaves. Preheat the oven to 350 degrees. 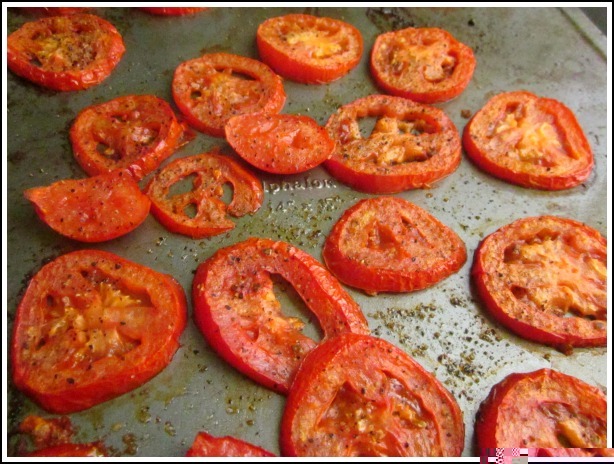 Spray a large baking sheet with non-stick spray, and lay the slices tomatoes in a single layer on the sheet. Brush with a little olive oil and hit with a few dashes of salt and pepper. Roast in the oven until starting to wilt, about 25 minutes. In a bowl, tear the collard greens into bite size pieces. Drizzle with just a touch of olive oil, massage into the leaves. 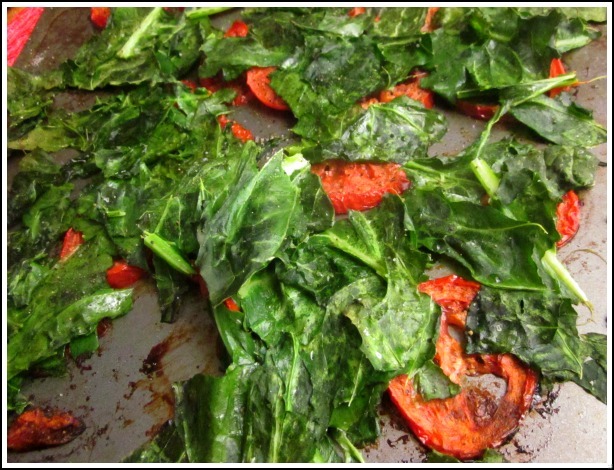 Place the collards in a layer over the roasted tomatoes, hit with salt and pepper, and put the whole tray back in the oven until collards are wilted and tomatoes start to brown, another 20-25 minutes. Put the beans (warmed) into a mixing bowl, and toss in the tomatoes and collards. Mix everything through and fresh squeezed lemon juice to top. Add more cracked pepper on top. 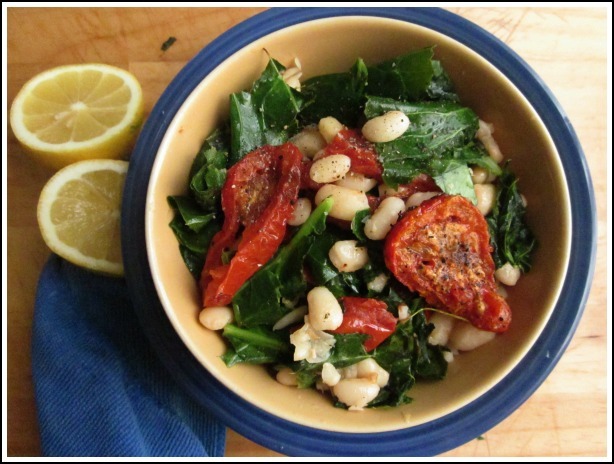 Collard greens, tomatoes and beans. This is a colorful, easy dish that can be eaten as-is or piled a top a slice of crusty bread and drizzled with more olive oil for an Italian inspired meal. *You may have some beans left over. Remember, you can freeze them for later use, throw them in soup, whip them into a dip, or eat them as is! Co-op meetings always make me feel like a superhero. I just leave feeling better and more optimistic about life, this town, the capabilities of people to create the things they wish to be a part of. It’s all incredibly inspiring. And it also makes me motivated to do things. Maybe it’s the work-hard, Rosie-the-Riveter-muscle-flex, You-Can-Do-It ethos flowing through my veins. I like it. I came home after a marathon grocery shopping (okay, and pink hair dye purchasing) spree only to clean the house, do a few loads of laundry, make several dishes for lunches this week, and get some writing done. In about an hour or two. A small feat to people who accomplish this on a daily basis (I’m looking at you, parents everywhere!) but productive and good nonetheless. 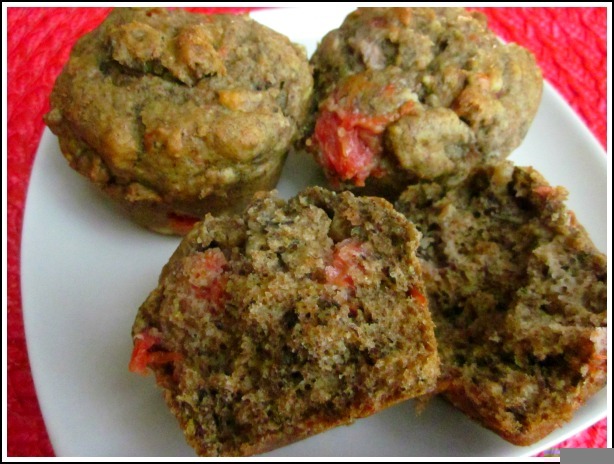 In the midst of all that, I made these muffins, which are so easy and adaptable to whatever ingredients you feel like tossing into the batter. This is a variation on a recipe from The Joy of Vegan Baking by Colleen Patrick-Goudreau. 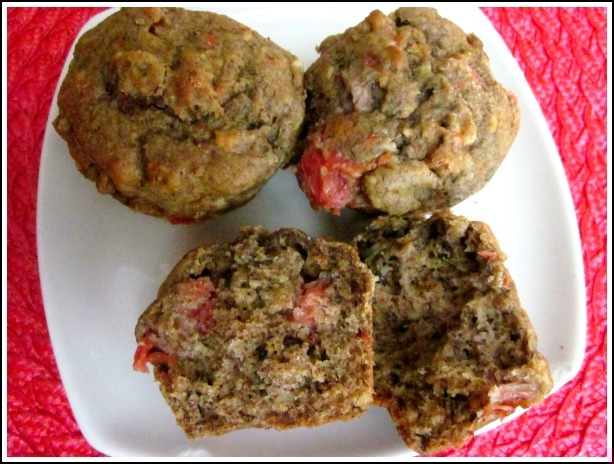 Originally Chocolate Banana muffins, I use a little less sugar than called for and have found that anything that goes well with the subtle taste of banana works well here. Go crazy. *This is the part that let’s you add anything you want. Preheat oven to 350 degrees. Mix all dry ingredients in a large mixing bowl. In a separate bowl, mix wet ingredients and mashed bananas until it is thick, almost like a paste. Add the dry to the wet ingredients, mix together. Add the walnuts and grapefruit pieces, mix through. Spray a muffin tin with cooking spray, or use liners. This should make exactly enough for twelve muffins (as long as they are regular, not mega-sized). Fill the sections of the tin to the top, and put in the oven for 20-30 minutes. I tend to think these are best in the 20-25 minute mark, when they are extra soft inside. Remember, there are no eggs so worry not about them being slightly “underdone”. You can, and should, lick the spatula and bowl clean. And if you have a loaf pan, and prefer your muffins in bread-form, that would work as well. A few days ago, I read this article which is a reaction to the people who gripe and moan and are sure to express to anyone willing to listen how much they hate Valentine’s Day. I respect anyone’s opinion – and if you hate it, you’re most certainly entitled to – but consider that all the energy spent on hating it, on hating anything you aren’t fond of, is just wasted and only feeds itself. Hating something (a person, a holiday, your job, etc) doesn’t DO ANYTHING to improve it. In fact, I bet the more time you spend thinking about how disgruntled it makes you, the less time you have to focus on all the things that make you happy. You could make a love sandwich from this bread valentine. If you’re on facebook, take a little gander at your online friends. While it’s true you may not know all of them in person, there are people out there who are interested enough in what you’re doing – in you – to want to follow and support you, even in a small way. I’m certain the contact list in your phone isn’t empty. And think about the last time you spend a day with friends and had a good, hearty laugh. I’ll bet it wasn’t that long ago. We live in an abundance of love. Look for it, and you’ll find it everywhere. READ THE ORIGINAL POST “I LOVE VALENTINE’S DAY” HERE. “At this point, nothing is more cliche — or more roundly depressing — than hearing the walking, talking Cathy comics trudge through the 14th talking about how much they hate Valentine’s Day. Yeah, we get it, you remember how single you are. Yeah, enjoying the love of other people in your life is just not the same, and offering your aunt a heart-shaped box of chocolate body paint would probably offer the wrong message. We get it. But does talking about how much you hate it really make you feel any better? Parsley was once the curly green garnish I left on my plate when my Mom, Gram and I would eat lunch at the old Boscov’s in Wilkes-Barre. I would gleefully eat the whole lemon slices from everyone’s iced teas, but every time I’d take a nibble of the parsley (and I did try, each time), I couldn’t understand WHY it existed except to work up my then-budding OCD by being the only remaining thing on a clean plate. These days, I am a total parsley convert. I always have it, and it’s notoriously the only plant I’ve been able to grow and keep alive for an entire season. I’m talking about the flat leaf, or Italian parsley – the curly kind is still quite bitter and leaves something to be desired. A natural breath freshener thanks to some aromatic oils in the leaves, parsley is a health food, touting a good amount of Vitamin C among other notable benefits. This past Saturday as I was squished up in bed flipping through the new Whole Living magazine (one of my all-time favorite publications), I found this simple recipe. The ingredients are minimal, and like me, you may have everything on hand already. 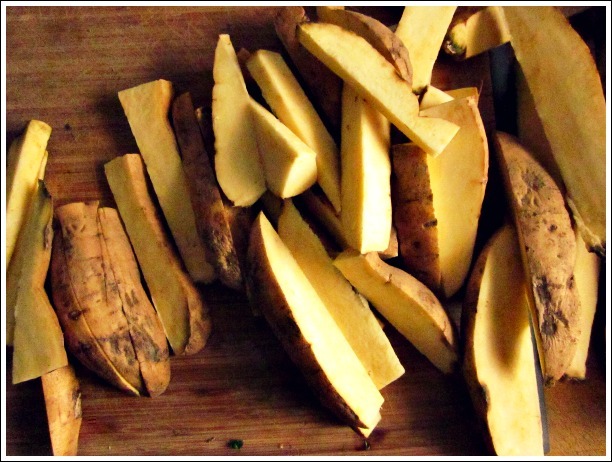 *The original recipe calls for orange sweet potatoes; I had white sweet potatoes on hand, but orange would be great and look pretty, too! Preheat the oven to 425 degrees. Put the sweet potatoes in a bowl (you may need to do this in two batches) and toss with 1 Tbsp olive oil, just enough to lightly coat, and season with salt and pepper. Put them on a rimmed baking sheet in the oven for 20-25 minutes. Turn once turing cook time. They will be tender and just starting to brown. While the potatoes are in the oven, make the pesto. 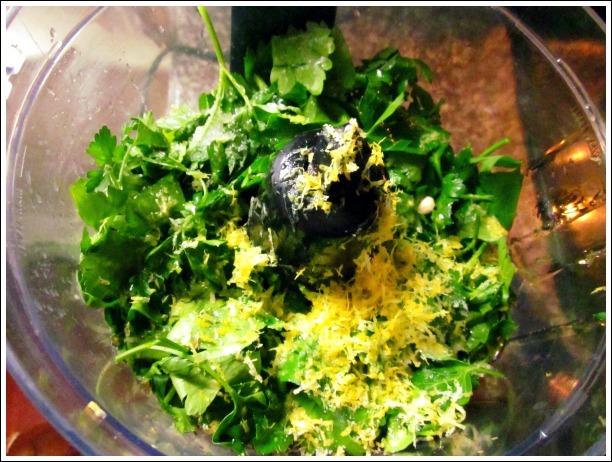 Blend the remaining ingredients in a food processor. You will need to stop and scrape down the sides of the processor once or twice to make sure everything is mixed through. Pesto will have somewhat of a chunky paste consistency. Allow the potatoes to cool for a few minutes. Plate the potatoes, then use a spoon or brush to spread the pesto over them. 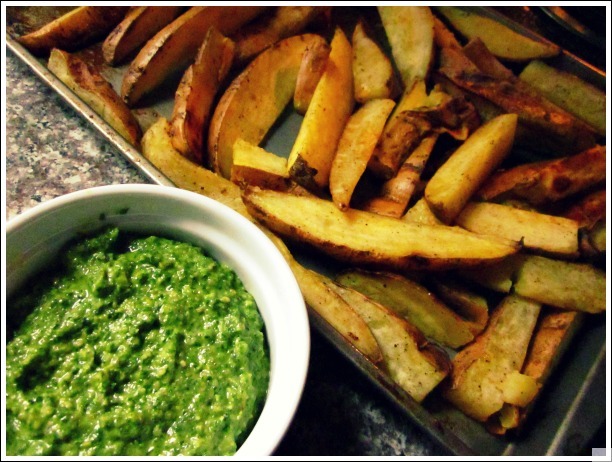 The hot potatoes will melt the pesto a little. Mmmm. White sweet potatoes and Parsley Walnut Pesto. 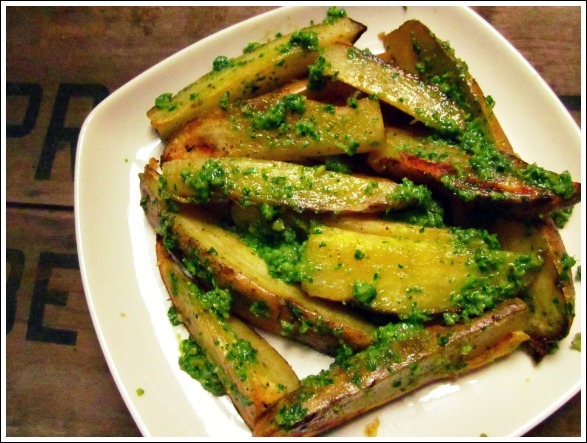 White sweet potatoes with Parsley Walnut Pesto. You will likely have at least 1/2 cup of the pesto left over. Use it as a spread on sandwiches (it would be delicious mixed into some Vegenaise), tossed with pasta, or spread over more roasted veggies. Enjoy! We all have roles in our relationships, and it’s probably no surprise that in my romantic/home relationship I am the cook and grocery shopper. I know where to find the ingredients I need at almost any store in an eight mile radius, as well as how much of that ingredient I’ll need. So when I got very sick and Ryan, bless his heart, did our shopping two weeks ago, he did it a little differently. When I told him to pick up some fresh ginger – “a good amount” as I wrote it down (to his credit I wasn’t very specific) – I was thinking of a larger piece instead of a small chunk. Well, he sure did bring home a “good amount”. 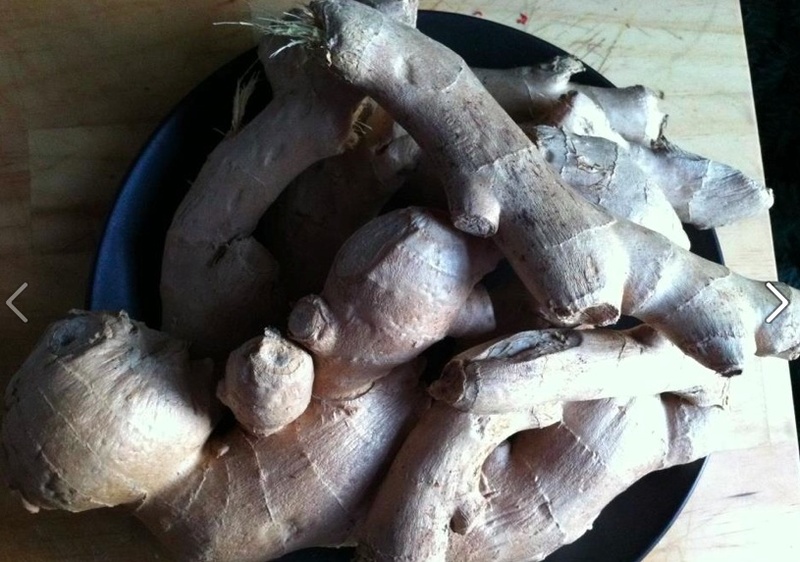 About two pounds worth of ginger, to be exact. Once I set some aside to freeze (I just found out you can do that! ), and after slicing a bunch to add to tea, I also needed to cook with it. I came up with this very simple, cleansing dish to use up some veggies we had in the fridge and add some protien and fiber to my diet of…tea. 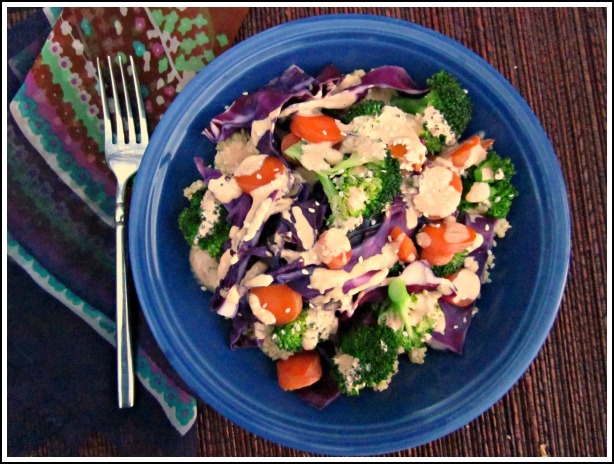 You can use any veggies or grains on hand. The tahini sauce is the star of this dish. INGREDIENTS (improvise!) 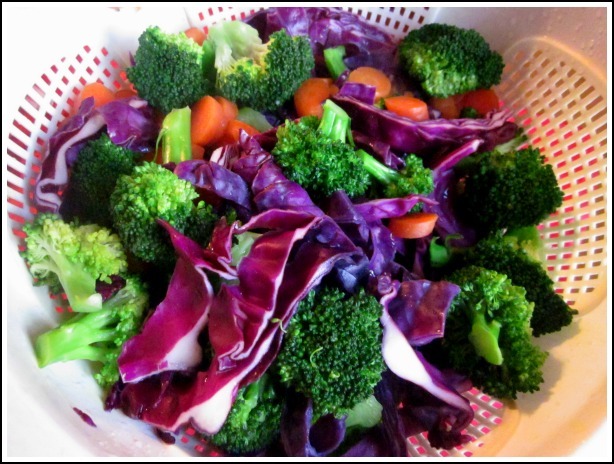 I steamed some broccoli, carrots and red cabbage til crisp tender. I cooked 1 and 1/2 cups quinoa in 3 cups vegetable broth. Put sauce ingredients into a blender or food processor and blend until smooth. Add more of any seasoning to taste. 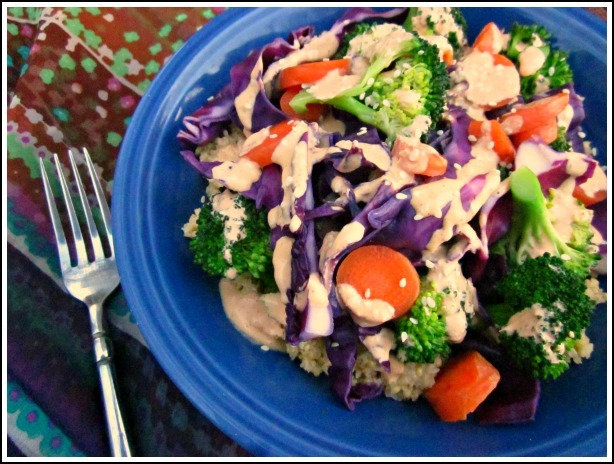 This is a healthy and quite filling dish that is easily adapted to whatever you have on hand. 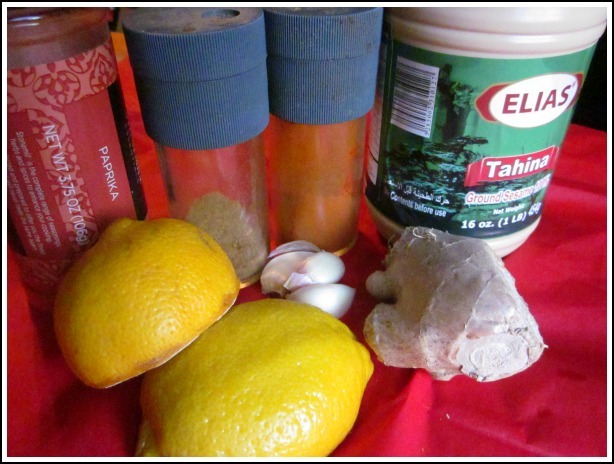 The tahini sauce would make a great salad or sandwich dressing, too. Make extra and store in a jar in the fridge for a few days.